Poor Mole. He is unhappy with his self-imposed Spring-cleaning. Escaping his hole one beautiful day to explore the loony life of the natural world, his adventure takes him to Rat and together they enjoy their world and embark on one or two rustic adventures with their friends. 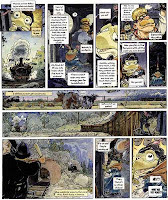 THE WIND IN THE WILLOWS is a delightful graphic novel adaptation of the original story. It is a wonderful thing to have an adaptation – be it a comic, animated or live action movie – focus on the details and the characters rather than just rush through the action sequences. The illustrations create the perfect, pastoral backdrop to the meandering story line of Mole, Rat, Otter, Toad and Badger. 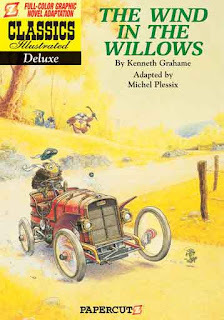 The graphic novel adaptation (deluxe edition) of THE WIND IN THE WILLOWS is perfect for the classroom. For those children who want to read chapter books but struggle with them, or for those children who love both chapter books and graphic novels, this edition fulfills the need. It will appeal to the struggling, average, and the high achieving reader. It is great literature. Other titles in the series include: GREAT EXPECTATIONS (available now) and TALES FROM THE BROTHERS GRIMM (available in May). This is a wonderful book to have in a classroom. Buy it, own it, and promote it. I suggest buying the hardcover, deluxe edition. It is a keeper. The religion-based books are still coming in. This week we received several Buddhist tales, one of which had a forward by the Dalai Lama himself. I’ve heard a lot about DC’s cold war saga The New Frontier, so I picked it up and look forward to reading it. Scientist Max Axiom guides the reader through the subject of global warming. We learn about greenhouse gases, how the atmosphere works, the role of carbon dioxide and other gases, how deforestation and pollution affect the environment, weather, climate changes, and how weather changes affect different parts of the Earth. From beginning to end, Max Axiom helps the reader make sense of this controversial issue and the ramifications of humans on the Earth. Our faithful narrator does not stop there. He also helps the reader understand how they can help solve the problem. 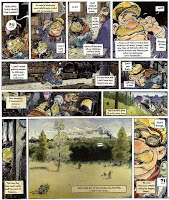 Capstone Press’ Graphic Library series of books is an amazingly well designed, well-written piece of comic literature. Aimed at helping young children learn important information in engaging and interesting ways, Capstone has put together a series of books essential to the classroom. From the writing, to the illustrations these books are very interesting and kids should find them fun to read. What better way to pique a child’s interest in science than to have them read a well-crafted, high quality comic book? After reading this, kids will be interested in investigating global warming on their own or in pairs or groups. Capstone offers information on how their titles fit into the state standards. Simply go to the book’s page and in the submenu at the right, choose your state and click on State Standards. Click here to see how this title fits into Missouri standards. Put those 1980’s Public Service Announcements disguised as comics out of your mind right now. UNDERSTANDING GLOBAL WARMING is nothing of the sort. Rather, it is a dandy book that will spark interest in science and promote learning in the classroom. You are seeing that correctly. 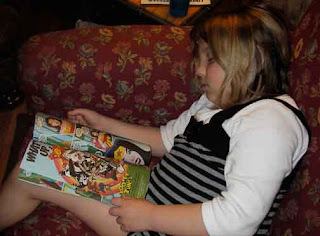 My 7-year-old daughter fell asleep tonight in the chair reading comics. It’s a great day when the progeny falls asleep while reading. Simply adorable. She loves to read all kinds of things. When she saw DC's newest title for children, SUPER FRIENDS #1 on my desk, she snatched it up and headed for the chair. I haven’t even had time to look at it. My friend and fellow educator, Scott Tingley, has helped his third graders set up their own website (Riverside Reads) to publish their works of art and literature, including comics. It’s a great idea, of course, and teachers across the world are embracing technology as a way to engage children and teens in their own education. Some drivel about students taking ownership of their education. Imagine! The coolest part is that the students will be focusing on creating their own, original pieces of art and literature, including comic literature, as well as reviewing current titles. I love it and cannot wait to rip it for my future classroom. It is an accepted practice among teachers to beg, borrow and steal from one another in order to secure the proper education of our youth. I am currently working on my eMINTS certification, which allows me to teach technology-based elementary classrooms. We will certainly be keeping a close eye on the project and wish Tingley and his third graders much success. If you remember from last week, I had so many titles come in that it was too much to list. So I split the list up. Even with the split there is plenty of comic goodness for you to peruse this week, titles that touch all age and grade levels. My work here at THE GRAPHIC CLASSROOM was recognized by the folks at Authentic Education, folks who just happen to be some of the great educational gurus of today. You can read the article here. This is really big news for me and for the comic literature movement. I hope that the article, expertly written by Thomas J. Hanson, can help bring more notoriety to the use of comics in schools. Billy is a little boy who is lost in a great big world. He is on his own living in an abandoned apartment and doing the best he can to get by. His only friend is an older, homeless man. One night, while Billy eats dinner with the old man around a barrel full of flame, he sees a man who resembles his father. Billy follows the man into the subway and onto a strangely colored red and yellow subway train. Billy soon finds himself in front of the old wizard who gives Billy his powers. 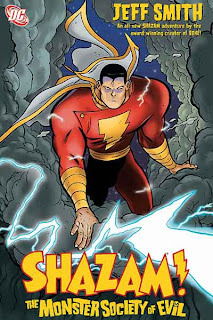 At the utterance of the magic words – “SHAZAM” – young Billy is quickly turned into the ripped, adult superhero known as Captain Marvel! In no time at all, Billy learns a valuable lesson about listening to grown ups especially wise old sages, as he disregards the warnings and goes where it is forbidden. His presence at the top of the magic mountain releases demons and such the world has never seen. Billy must become Captain Marvel and save the world from utter destruction. Jeff Smith is a master comic creator. He has a knack of putting together great stories and art for all ages. SHAZAM! is a throw-back to nostalgic comic days; it is charming, poignant and fun. Most of all, it is a book that can be enjoyed by readers of all ages. Smith does the coolest thing at the beginning of his chapters. He puts the chapter name in code and then provides the key. How fun is that? It made me yearn for my old superhero decoder ring. I loved it. I knew right then that this was going to be a fun story and I was not disappointed. The story is especially interesting and appealing to children because it centers around a child who turns into an adult superhero and saves the world. Smith pays attention, inserting bits of real life into his story. On the second page of the story, the television newscaster talks about a politician losing to his dead opponent’s wife. That actually happened in Missouri during the November 2000 election when John Ashcroft ran against incumbent Mel Carnahan for US Senate. Carnahan died unexpectedly in a plane crash and it was too late for his name to be taken off the ballot. Ashcroft lost against his dead opponent. Carnahan’s wife, Jean Carnahan, was appointed to the Senate seat. John Ashcroft was later appointed as Attorney General for President Bush. You can read the CNN account here. This can help teach kids to look for and make text-to-world connections. One glance at the art and it is obvious that Jeff Smith was at work. The style is inexplicably his and is reminiscent of his wonderful opus, BONE. He has the wonderful ability to create art that is appealing to both children and adults. It is great. This is a book that parents and children could sit down and read together. They should; it’s great. When Billy enters the subway system, he gets onto a subway train which is colored and designed to look like Captain Marvel, what with the red and yellow colors and the lightning bolt running the length of the crown. This is a perfect opportunity to teach children about foreshadowing and predicting. Any students studying elections or citizenship could use SHAZAM! to talk about elections, even though that is not what the story is about. Kids would find it very interesting to know that a candidate ran and lost against a dead opponent. This is where history stops and fiction begins. The Attorney General is an evil and corrupt government official and he is one of the central antagonists, determined to gain power and control. The dust jacket unfolds into a poster. SHAZAM! THE MONSTER SOCIETY OF EVIL has a golden age feel to the story, yet the art is modern. It is a good tale that allows children to pretend they are powerful, superhero grown-ups who are important. Captain Marvel is a wonderful, classic hero that children can believe in. There was so much that came into the classroom this week – so many titles, so little time – that I have decided to list half of them next week. I want you to have the chance to look through all the titles. I have acquired several books as part of my upcoming series on religious titles in the classroom. This week saw representation from Judaism (The Rabbi’s Cat) and Islam (Kampung Boy and The 99). I am really looking forward to this series. I am also excited about my L. Frank Baum books. The famed writer wrote two of this week’s titles: The Wonderful Wizard of Oz (a new title from Image) and The Life and Adventures of Santa Claus. The latter is illustrated by one of our favorite artists, Mike Ploog. If Speed Racer was a part of your childhood, then you might want to check out the new adaptation by IDW. Kristy, Mary Anne, Claudia and Stacey start their own club – a baby-sitting club. They work together to get clients and build their successful business, but like any club, they have their problems. This graphic novel is all girl, as if you could not tell that by the cover, the title, and the source material. It is not a typical action-based comic repackaged with pink covers and female protagonists. THE BABY-SITTER’S CLUB is a thoughtful book written with girls in mind. The plot revolves around the club and interpersonal relationships between the girls and the outside world. Each of the four young ladies is developed in such a way so that just about any reader can identifying herself with at least one of the characters. Life is not all sugar, spice and everything nice. The girls deal with typical problems: competition, divorce, disease, jealously, but most of all they deal with drama and plenty of it. The delicate interplay of youthful female relationships drives the story and the character development. If you want a story of girl-world, then this is it. If the male reader gets nothing else from this book, he will certainly come away understanding that seemingly minor squabbles between friends are serious concerns for young girls – a good thing for the male teacher to know. For young ladies, this series is the how-to of growing up girl. The art consists of straightforward line drawings with little shading or contrast. The girls make entries in the club diary, which are illustrated using different handwriting fonts for different girls. This was a nice technique and acted as a precursor to the upcoming chapter, helping students make predictions. Nice. The characters are distinctive, but the use of color would have greatly added to the story and the character development. These characters are in seventh grade, so I suspect that students starting in grade four would be most interested in this series, although I personally do not see anything objectionable or questionable for younger kids. The comic adaptation of Ann M. Martin’s successful series gives the student another choice when it comes to reading. For those with disabilities, or those for whom reading a novel is a daunting task, the comic adaptation is a perfect precursor to traditional literature, although it stands on its own just as well. I see an economics lesson here as well. These girls create a business, market it, and define the rules all by themselves then they manage the problems. This series could also be helpful when dealing with young girls and helping them navigate their relationships. I think THE BABY-SITTERS CLUB should be required reading for any teacher who deals with young girls. This graphic adaptation was based on Ann M. Martin’s series of traditional novels by the same name. It is wonderful to have a comic that is designed for girls. There has been an historical tendency for girls to be left out of the comic industry. That has changed and I am glad to see it. Go girl! We had a sampling of titles from the Classics Illustrated series come in this week, this set from Jack Lake Productions. It should not be confused with the Classics Illustrated series from Papercutz. For those of you who have read comics for many moons, then you may remember this nostalgic series. You may notice that there are a few religion-based manga comics this week. The Graphic Classroom is working on a series of articles and reviews on making religious comic literature available to students. Most public school libraries have a religion section. Our recommendations obviously include adaptations of religious texts, but also biographies and fiction rooted in religion. Most importantly public school teachers and librarians must make a good faith effort to include many different religions or religious views.